Fluence’s Breeze air stripper serves as a low-maintenance, cost-efficient alternative for filters, packed towers, and mechanical aerators for fast, efficient removal of contaminants from water and wastewater in a wide variety of applications, including potable water contamination and groundwater contamination. The Breeze is a highly efficient technology capable of removing nearly 100% of volatile organic compounds (VOC) and other gases dissolved in water. The Breeze air stripper consists of a tank made of high-strength polypropylene, an air blower, an internal air header, and patented non-fouling CYCLONE® II diffusers. Contaminated water is fed into the Breeze air stripper tank and forced to flow in a serpentine pattern into uniquely designed multiple aerated chambers. The serpentine water flow maximizes detention time, and increases the air-to-water contact. The blower provides air to the diffusers, and the rising bubbles and turbulence provide the air-to-water interface required for efficient air stripping and contaminant removal, without the need for packing or media. The tank diffusers resist fouling caused by iron, calcium, and biological activity. 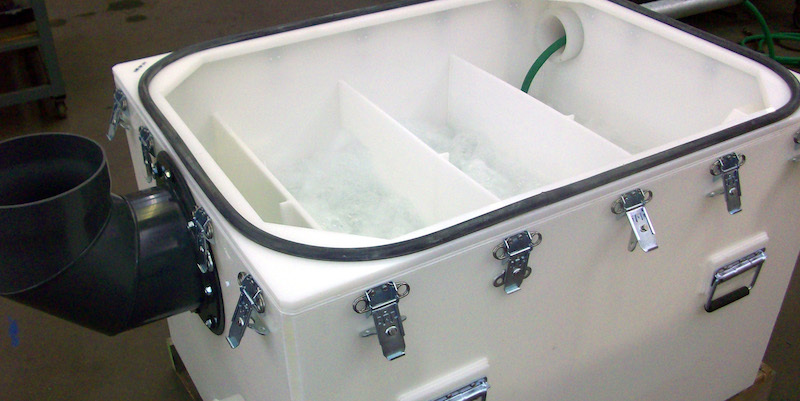 Each Breeze tank chamber comes with an adjustable weir plate to maintain proper water levels and performance without the need for complicated electrical controls. The system can be operated with an induced draft or positive displacement blower, using either coarse or fine bubble diffusers. A blast gate throttle allows the user to ramp up air-flow rates to provide a factor of operating safety. Single units can handle flow rates up to 200 GPM (757 liters per minute). We’ve designed Breeze units to be compact, and to leave a small footprint. Multiple units can be placed in a series or stacked vertically to handle almost any flow rate. What Contaminants Can the Breeze Remove? Contact Fluence for more information about our Breeze air stripper, leasing options, or to request a quote.